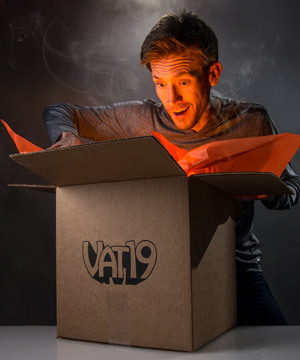 The Mysterious Box of Mystery: Surprise curated selection of Vat19 goodies. 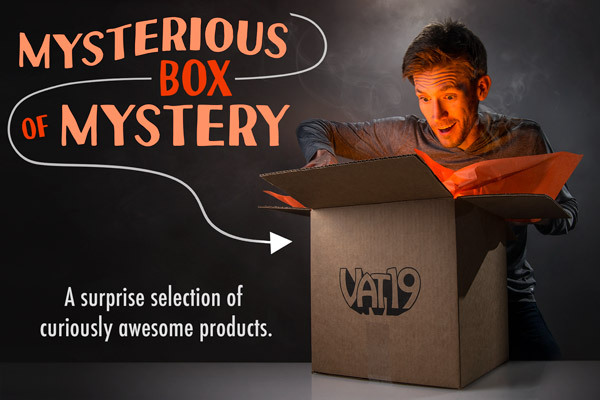 The Mysterious Box of Mystery is a special selection of Vat19's curiously awesome products. In fact, they're even more curious than usual since you have no idea what you'll be getting! 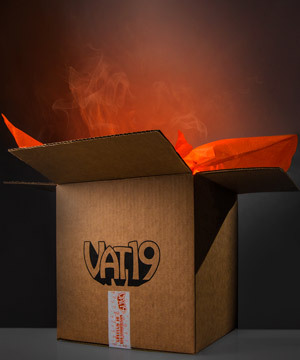 Each box contains several different items from the shelves of Vat19's warehouse that represent some of the most awesome stuff you can buy. Each order is a surprise, and each order is a great deal since buying the contents individually would cost more than getting them in this boxed bundle. ** Looking for a monthly dose of mystery? ** Check out our subscription service! Question: I want to purchase multiple Mysterious Boxes of Mystery. Will they each have the same stuff inside? Answer: Yes, boxes of the same style will contain the same items. While we do swap out the contents occasionally (see below), it's best to assume that boxes of the same style are identical. Question: I saw videos on YouTube and everyone got "X" in their Mysterious Box of Mystery, but I didn't get that item in my box! Answer: If you really want a particular item, we suggest you simply purchase that item. The Mysterious Box of Mystery changes often, and it's meant to be a surprise. We strive to ensure that the retail value of the items included in each box exceeds what you have paid for the box. The trade-off, obviously, is that you don't get to choose the contents of the box. If you'd prefer a deal without the mystery, check out our coupons. Question: What's the difference between the different boxes? Will I get more expensive items in the costlier boxes? Answer: Not necessarily! A more expensive box doesn't guarantee that you'll receive more expensive items. Instead, you may find that a Large Mysterious Box of Mystery contains twice as many items that are of similar price to what is found in a Small box. However, it is possible that some Large, Mega, or Ultra Mega boxes would contain higher priced items. This is all part of what makes these boxes so mysterious! Question: What if I don't like what's in my box? Answer: Impossible! In all seriousness, we work diligently to include a variety of popular items in each iteration of the Mysterious Box of Mystery. We're certain you'll be pleased with our choices. However, due to the pre-packed nature of this product, we cannot accept returns. Remember, surprises are fun! Question: The box I received is smaller than the one pictured! Answer: A smaller box doesn’t mean it’s inexpensive. A small item may be expensive (see engagement rings and iPhones). Our goal is to pack a variety of items that appeal to a wide range of interests and ages into each and every box. Because they are made in small batches, the size of each Mysterious Box of Mystery will change frequently. Question: How often do you change the contents of the Mysterious Box of Mystery? Answer: We pre-pack each style in small batches. As one style is close to selling out, we create new ones. We attempt to vary the contents with each new batch we create. Below is a detailed accounting of when new batches were created. Question: Do you have a monthly subscription service for the Mysterious Box of Mystery? Answer: YEEESSSS! It's called the "Monthly Mysterious Box of Mystery... Every Month". Question: Will my 8-year old love every item inside the box? Answer: We hope so! Please keep in mind that the Mysterious Box of Mystery is designed to appeal to a wide range of ages and interests. Remember, surprises can be fun!